Asbury's campus offers the resources students need to thrive, from state-of-the-art media facilities to athletic fields to a more than 700-acre Equine Center. 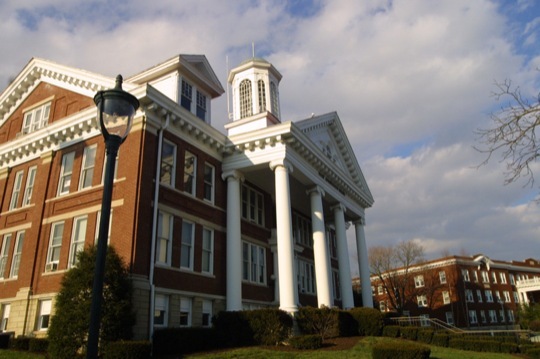 Asbury University’s 65-acre main campus contains more than 30 buildings, ranging from historic Greek revival to contemporary architecture, athletic fields and a cross-country course, all within easy walking distance. Hager Administration Building, completed in 1910, is one of the oldest structures on campus and is listed on the national register of historic places. Since 1929, Hughes Auditorium has been the site for campus community worship and revival. And Kinlaw Library, a high-tech information center, was completed in 2001. All of these buildings are located along Macklem Drive, the University’s tree-shaded semi-circle green where generations of Asburians have studied, laughed and prayed together. The total University property spans 739 acres, which includes our equestrian center and ropes challenge course. Come see for yourself why people say you just have to set foot on this campus to know that something’s different here.